While the new Reminders app that Apple built into iOS 5 isn’t as full-featured as some other task management apps in the App Store, it does offer a few clever niceties. Among the app’s best features are its ability to sync to-do lists and share them with other users via iCloud and its tight integration with Siri on the iPhone 4S. There’s no Reminders option on the iCloud homepage. Instead, you need to click on the Calendar icon; just as Reminders syncs with iCal on the Mac, it syncs with the Calendar app in iCloud. On the left side of the Calendar view, you’ll see a list of your iCloud-synced calendars, followed by any iCloud-synced Reminders lists. If you don’t see any Reminders lists in that left pane, that means you haven’t yet created any in the iOS app. No worries: You can even create a new list from the iCloud website. Click on the gear icon at the upper right, and choose New Reminder List. Type a name for your new list, and you’re good to go. Click on the circular Broadcast icon to choose whom you'd like to share your list with. Once you’ve identified the list you’d like to share with someone else, click on the Broadcast icon—the one that looks a bit like the Wi-Fi signal icon. In the pop-up window, enter the email address of the person (or people) you’d like to share that list with. 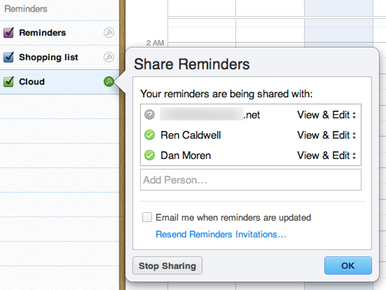 When you add people to a Reminders list, they receive an email. If they click to join the list, that list and its entries will now appear for them, on their iCloud and iCal lists and in the Reminders iOS app. You can choose whether list subscribers can merely view the list, or (the default) view and edit it. With the right syntax, you can use Siri to add items to your shared list, too. Now that my wife and I share a shopping list, we can both add items to a list that we can both access. Even better, with the iPhone 4S, I can add items to our shared list by talking to Siri—though Siri requires that you use a specific syntax to add items to a non-default list: Add 'two gallons of skim milk' to my Cloud list. Remember that sentence structure, and you can easily add new items to your shared list through speech. Want to make things even simpler? You can make your shared list the default Reminders list—that’s the one Siri will add to if you simply say, “Remind me to buy eggs.” To change your default list, launch the Settings app, tap on Mail, Contacts, Calendars, and scroll to the bottom, where Reminders is listed. There, you’ll see an option to change your default list. Normally, if you say, “Remind me to buy eggs,” Siri will then ask you when to remind you. If you don’t want to assign a specific time to your task, just say, “I don’t know,” and Siri gets the idea. If you want to get really fancy, you can take advantage of Reminders’s ability to alert you when you arrive at a specific location. Add your local supermarket as a contact in your iPhone’s address book, and of course add its address. (I called mine “The Supermarket.”) Now, you can say, “Remind me to buy eggs when I get to the supermarket”; when you—or whomever you’ve shared your list with—arrives at the supermarket, Reminders will, well, remind you—or whomever—about the item(s) on your list. Hat tips to Hints reader unsoluble, blogger Shawn Blanc, and Neven Mrgan.